Spring Boot makes it easy to create stand-alone, production-grade Spring based Applications that you can “just run”. We take an opinionated view of the Spring platform and third-party libraries so you can get started with minimum fuss. Most Spring Boot applications need very little Spring configuration. By using spring boot , your application will become quite simple to implement. You can focus more on your business without taking care of boring configurations. Create a new spring boot project in https://start.spring.io/, select the libraries you needed. Quartz can be supported since spring boot 2.0.0-M2. Let’s create a gradle project with spring boot 2.0.0-M3 in our cases. Quartz provide a scheduler factory for you to get a scheduler, you can simply autowired SchedulerFactoryBean and invoke getScheduler() to grab a scheduler instance. If you want to something more, such as have your own job. You need to implement the execute method of Job in quartz. Then you need to binding your job to JobDetail as defined in javadoc of Quartz. Conveys the detail properties of a given Job instance. JobDetails are to be created/defined with JobBuilder. You will find the print message in your console. Something more than quick start? As you can find in the methods list, you can use schedulerListener to track the progress of your job and scheduler such as by invoking jobPaused, jobResumed. 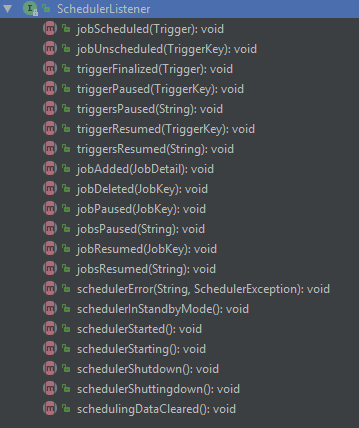 JobListener can be used when a JobDetail executes. TriggerListener can be used to track trigger actions and status. There are a lot advanced method supported in http://www.quartz-scheduler.org/api/2.1.7/. You can have more details in the document. Quartz is a quite useful library for scheduling. It is supported in spring boot 2.x, you can easily use it in your sprint boot projects. Enjoy!